I have had so many gauge troubles with these socks. I just couldn't get the right gauge, just not quite. Well, short of getting some 0 dpn's, as I only have 1's and 2's, and 0 in circular, but one 16" only. I think I've got it now. I'm onto the fourth repeat of the instep main pattern....getting very close to beginning the gusset. 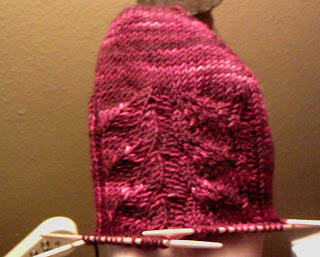 The pattern is lovely so far. Easy to follow, and it's got enough variance to keep me excited and happy, but not too much to boggle, and not too little to make me bored bored bored. So....I'm beginning to have a little bit of an obsession with Biscotte & Cie's yarn. I haven't even bought any yet, but she has so much Harry Potter themed yarns, Captain Jack, and so many amazing other colorways based upon scenes, thoughts, etc. And the yarns actually knit up into patterns, like the one that looks like real watermelon with seeds. I bought this yarn for Miss M's little sock project, and as I was winding it and commenting to Jim that it looks really amazing (and I'm not the biggest fan of pink) - he told me it looks like the Cheshire Cat. I've always been a huge fan of Alice in Wonderland and still want an original publishing of it....well, he's right! I wonder if there's a way I can capture that theme into the socks? I don't find many inventive child sock patterns. I could adapt one perhaps. Depends on my skills. How am I ever going to get anything done for the new baby? I have too much and too many people to knit for as requests come pouring in lately. The baby will be here in about a month. Wait, that can't be right?! Seriously? Wow, I need to buy some bamboo diapers still, and make more longies. I always had a sock obsession (I like that word), and then I sort of "grew" out of it. I remembered it when Miss M began to collect weird, funky, fun, and interesting socks. I don't even own any socks of my own right now. Yes. How did that happen? I've been wearing Jim's during cold weather. Which he blames me for all of his missing socks. Which is just such a lie. I mean, I'm the one that puts them in the laundry, washes and puts them away. But him....I just found a pair of his socks that he lost in the couch cushions a few days ago. The couch was a famous place for him to "lose" his socks on a weekly basis. I think when it comes to sock issues, he just needs to look inward and face the truth. Sorry my darling...but you know I don't like lying. So....now I understand my psychology behind why I want to knit every sock pattern I see and buy massive amounts of sock yarn. My old obsession is reemerging and now it involves crafting. Mmmm. Sweet obsession. And soon, I may have my first pair of socks in years. And then I can move onto the Harry Potter sock patterns. Do you know there are at least 30 of them? Harry Potter fans rock. Rock my socks in fact.